Last weekend was a crazy whirlwind of diabetes-based shenanigans! I was already looking forward to #TADtalk2017, 'Talking about diabetes' having missed the first one last year I made sure I reserved my place as soon as I was able. It looked like a brilliant chance get inspired by some fantastic speakers and to meet in actual real-life with many people that I have 'known' for years, but only as 32px square avatars and 140 character encouragements. Plus a chance to catch up again with some of the others in the #doc that I've already had the good fortune to meet up with. Altogether, not one to be missed! Then, out of the blue I received an invitation to attend Medtronic's second 'Diabetes Community Exchange', which was to be held in Amsterdam over the same weekend. Fortunately I was able to go to the main part of MDCE, on Friday and return early Saturday morning just in time for #TADtalk2017. I am planning to post a more detailed account of my experiences with Guardian Connect, as I'm only a week in. But so far, so interesting. It's a standalone CGM, that does not link with any current UK Medtronic pump, but what it does offer is the display of your sensor glucose readings directly on your iPhone in the Guardian app, along with an automated upload to Carelink in the cloud, which means you can grant access to your BG data to partner/parent/friends/family, who can make sure you are safe. 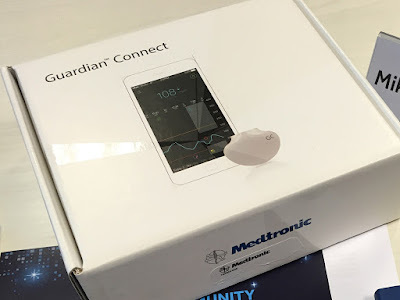 For now though I just wanted to post a brief video montage of my weekend to give you a flavour of what went on, including a fascinating trip to the Diabeter Clinic in Rotterdam, where we went to get kitted up with our Guardian Exchange CGM. Diabeter is a specialist independent diabetes clinic which has been running since the 1970s. Their headquarters is in Rotterdam, with 4 centres in total. Diabeter is recognised as a top centre for diabetes care and research. Medtronic acquired the clinic in 2015, but I'm not sure what if any influence they have over its running - Diabeter certainly retains its clinical, brand and therapy independence. We were able to have a brief tour while we were there and the friendly and genial Dr Aanstoot talked us through some of the innovative approaches that define the Diabeter style. I was really impressed by the patient focus in everything they do. And in their adoption of new technologies and ways of delivering care, including a weekly 'Facebook Live' question-and-answer broadcast which is being enthusiastically adopted. The look and feel of the place if very much 'non-medical' and could be a smart advertising agency office, or cool apartment depending on where you look. Light, airy and a great sense of space and calm. 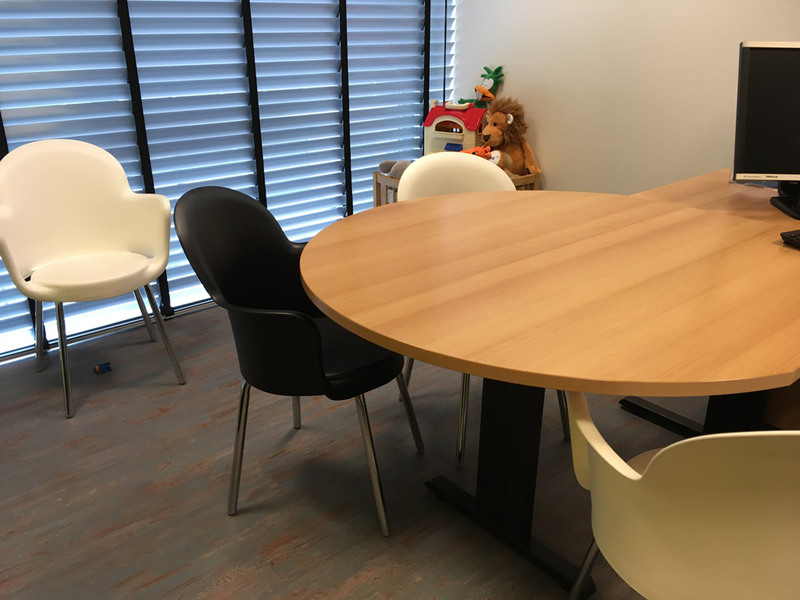 Increasingly they find that people with diabetes increasingly value ad-hoc contact via video call or telephone in preference to regular calendared appointments, though you can also go in for a conventional face-to-face meetings if that is your thing. They have their own data management system which can accept information from any of the 'usual' upload systems (Diasend, Carelink etc) and which then crunches your data into something usable and understandable. And once you have got used to the reports, they always stay the same - even if you change your diabetes technology. The reporting system can analyse your data and alert you if it spots patterns that may need your attention, or flag things up so that the clinic can approach you with a, "How are things going?" conversation - again this is a preference you can agree with the clinic. It was great to hear that they have an experienced diabetes-specialist psychologist on hand if you need that support too. There were lots of small details which stood out, including this in one of the 'family rooms'. "We use round tables" said Dr Aanstoot gesturing in through the glass-partitioned doorway. "Much less confrontational. We don't want to be Dr on one side telling you what to do, with the family on the other. We want to be working together." It was a great opportunity to be among a group of diabetes bloggers from all over Europe, and as far away as Dubai. Both people living with diabetes and a parent of a T1 child. Sara, from Sweden, who manades her diabetes with MDI had been wearing the Guardian Connect since February. A couple of others, myself included, were wearing MM640G with Enlite sensors and were watching to see how the traces compared. For others, this seemed to be their first experience of continuous glucose monitoring. We had dinner and chatted long into the night, as people with diabetes often do. It was perhaps a slight error of judgement to find myself drinking Talisker with Kevin from Belgium, along with Bastian and Richard of #DEdoc fame until passed midnight and with a 5.20am taxi ahead of me - but I was glad to be able to make the most of my short time in Amsterdam. Pictured: Lovely Medtronic and Diabeter peeps, plus Kevin (Belgium), Sofiane (Switzerland), Sara (Sweden), Mel (UK), Lisanne (Netherlands), Christophe (France), Richard (Germany), Oscar (Spain), Abdullah (Dubai), Bastian (Germany), Dr Aanstoot (Diabeter) and Angel (Spain). The Medtronic Diabetes Community Exchange event continued on Saturday, but Melanie Gray (Stephenson) and I had to bid a sad farewell as we hurried back for TADtalk in London. Though it has to be said that Mel made a considerably better choice for return flight time, and was able to stay for breakfast at the hotel. Huge thanks to Mireille (sp??) and Aurelia (sp?!) and the others from Medtronic and Diabeter whose names I cannot remember (sorry!) for making the event so enjoyable and informative. It was an honour and a pleasure to be there. I was really looking forward to TADtalk, having seen such inspiring coverage on social media last year. Suffice to say it more than lived up to my expectations. Brainchild of Dr Partha Kar, Dr Catherine Peters and Prof Peter Hindmarsh that sprang out of a conversation in the back of a taxi, TADtalk (Talking About Diabetes) brings together inspirational speakers who share their experience and insight into meeting and overcoming the challenges that living with type 1 diabetes can bring. The talks themselves are videoed and distributed freely, as were last years, so do go and check them out. This year's TAD Talk was smoothly hosted by safe pair of hands and everyone's second favourite T1 newsreader, Stephen Dixon, and the avalanche of tweets was storified by Diabetes UK. The glowing lineup of speakers included Sir Bruce Keogh, Miss Jen Greaves, Gavin 'Diathlete' Griffiths, #gbdoc's cat lover of choice Adrian Long, Roddy 'insane artic marathon challenge' Riddle, Mel 'international athlete' Grey, and not forgetting 'head of all the nurses and under-the-radar T1' Jane Cummings. There are some great blog posts that describe TADtalk2017 in more detail. See type1bri.com, type1adventures, Mel Stephenson, Adrian Long, and circles-of-blue for examples. My overriding impression in the train on the way back was one of being uplifted, supported and encouraged. Having a whispered conversation with Mel Stephenson and top Jelly-Baby organiser @type1hurdles all the way back, having only met earlier that day. Everyone involved should feel rightly proud. And if you get an opportunity to go to one, I would thoroughly recommend it. See more video noodlings on my Youtube thinghy. Disclaimer: Medtronic paid my travel and accommodation to attend MDCE, and laid on a tasty dinner in the evening. I was also offered a free trial of the Guardian Connect for a month. I have not been paid to write this post or any post, and any opinions on what is good or bad about the technology are mine and mine alone.